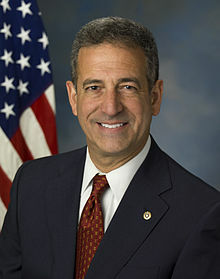 Russell Dana Feingold (born March 2, 1953) is an American lawyer and politician from the U.S. state of Wisconsin. He was the Democratic nominee for the U.S. Senate in 2016, and previously served as a Democratic member of the U.S. Senate from January 3, 1993 to January 3, 2011. From 1983 to 1993, Feingold was a Wisconsin State Senator representing the 27th District. On May 14, 2015, Feingold announced his candidacy for his old Senate seat in 2016. He was defeated by Republican Ron Johnson in a rematch of their 2010 Senate race. On concerns over the passage of the Patriot Act on October 25, 2001, in Whitehead, John W. (January 24, 2011). "Renewing the Patriot Act While America Sleeps". The Huffington Post. Retrieved on 20 August 2018. I first voted against the PATRIOT Act because much of it was simply an FBI wish list that included provisions allowing our government to go on fishing expeditions that collect information on virtually anyone. U.S. Senator Russ Feingold On the President's Remarks Today Regarding Trade (press release). feingold.senate.gov (March 23, 2005). Archived from the original on April 12, 2008. Retrieved on 20 August 2018. Senator Russ Feingold Statement on CAFTA (press release). feingold.senate.gov (June 30, 2005). Archived from the original on April 12, 2008. Retrieved on 20 August 2018. On the Iraq War, in Roberts, Joel (February 28, 2006). "Senate Resoundingly Renews Patriot Act". CBS News. Retrieved on 20 August 2018. On the Roberts, Joel (February 28, 2006). "Senate Resoundingly Renews Patriot Act". CBS News. Retrieved on 20 August 2018. Feingold Pushes to Keep Arctic Drilling out of Budget Process (press release). U.S. Senator Russ Feingold (March 6, 2006). Archived from the original on April 12, 2008. Retrieved on 20 August 2018. On the National Security Agency's warrantless surveillance under President George W. Bush, in O'Keefe, Ed (March 12, 2006). "Feingold Calls for Bush's Censure". ABC News. Retrieved on 20 August 2018. For so many who had been driven from their office buildings, these five weeks were only the prelude to spending months cloistered in cramped and inadequate office space while they advised senators on some of the toughest calls they would ever have to make ... As the gap widened between perceptions of fear or danger in Washington and in much of the rest of the country, I believe it had a significant influence on why representatives reacted to terrorism concerns in a way that was fundamentally different from most of their constituents. On the effects of the 2001 anthrax attacks, from While America Sleeps: A Wake-up Call for the Post-9/11 Era, as quoted in Moyer, Justin (March 8, 2012). "The speed read: ‘While America Sleeps,’ by Russ Feingold". The Washington Post. Retrieved on 20 August 2018. We seem to rely on very bad things happening in order to come together. We’ve got to do better than that. In 2001, I first voted against the PATRIOT Act because much of it was simply an FBI wish list that included provisions allowing our government to go on fishing expeditions that collect information on virtually anyone. Today’s report indicates that the government could be using FISA in an indiscriminate way that does not balance our legitimate concerns of national security with the necessity to preserve our fundamental civil rights. This is deeply troubling. I hope today’s news will renew a serious conversation about how to protect the country while ensuring that the rights of law-abiding Americans are not violated. Following revelations that the National Security Agency was receiving phone records belonging to millions of Verizon customers on a daily basis, in Terkel, Amanda (June 7, 2013). "Watch The One Senator Who Voted Against The Patriot Act Warn What Would Happen (VIDEO)". The Huffington Post. Retrieved on 20 August 2018. Something is happening in this country tonight. I don’t understand it completely. I don’t think anybody does. Concession speech to supporters after losing his 2016 bid for the Senate, in Blumberg, Nick (July 30, 2018). "How Wisconsin Went Red: New Book Traces Fall of ‘Progressive Bastion’". Chicago Tonight. Retrieved on 20 August 2018. I would urge you to be as restrained as you can be as the next steps occur. I don’t know exactly what they’re going to be, this could be one of the most challenging times in the history of our country. Concession speech to supporters after losing his 2016 bid for the Senate, in Rivera, Adrian (January 10, 2018). "An Interview with Democratic Wisconsin Senator Russ Feingold". The Politic. Retrieved on 20 August 2018. The lesson from Charlottesville is not how dangerous the neo-Nazis are. It is the unmasking of the Republican party leadership. In the wake of last weekend’s horror and tragedy, let us finally, finally rip off the veneer that Trump’s affinity for white supremacy is distinct from the Republican agenda of voter suppression, renewed mass incarceration and the expulsion of immigrants. Commenting in the aftermath of the Unite the Right rally in Charlottesville, Virginia, in Feingold, Russ (August 19, 2017). "How the Republican party quietly does the bidding of white supremacists". The Guardian. Retrieved on 20 August 2018. Anything short of radical change to the Republican party’s war on voters of color is merely feigned outrage. Even if the white supremacists are condemned, even if the entire Republican party rises up in self-professed outrage at white supremacists, if voter suppression and other such racist policies survive, the white supremacists are winning. And America is losing. I don’t want there to be a catastrophe, I hope there never is another one, there probably will be, but it is really terrible that we need, we seem to rely on very bad things happening in order to come together. We’ve got to do better than that. Rivera, Adrian (January 10, 2018). "An Interview with Democratic Wisconsin Senator Russ Feingold". The Politic. Retrieved on 20 August 2018. Senator Russ Feingold is an embarrassment to the US Senate, which makes him an authentic hero of the Republic. The Wisconsin senator gets up and says out loud what half of the country is thinking and talks about every day. William Greider, in Greider, William (March 14, 2006). "A Peculiar Politician". The Nation. Retrieved on 20 August 2018. Molly Ivins, in Ivins, Molly (March 2006). "Molly Ivins: Enough of the D.C. Dems". The Progressive. Retrieved on 20 August 2018. Jon Stewart, in Frommer, Frederic J. (March 23, 2006). "Comedian backs Feingold’s censure call". The Associated Press. La Crosse Tribune. Retrieved on 20 August 2018.